The Girl and the Ghost has been out there for a little while now. It seems very odd to type that. I worked on this project for so long that I don't think I've processed that it's actually finished and available for all to see. A few nights ago, while working to promote the movie and get the word out, I started thinking about how it all started and thought maybe I should write it out for posterity and for anyone interested in the behind-the-scenes aspect of things. I think it was Christmas 2006, I was at my Grandma's house and surrounded by family. 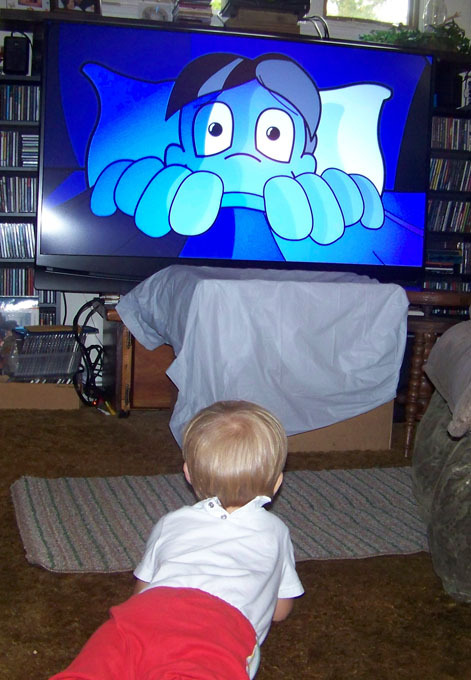 Some of my cousins were pretty young at the time and I found myself frustrated that I couldn't show them most of the animated shorts I had worked on. My most recent projects were Tootsie Blow Pop and Batman's Gonna Get Shot in the Face and while I'm proud of them, they definitely aren't for little eyes and ears. I wanted to make something that anybody could watch. So, I started brainstorming. My goal was to create an animated short that kids could enjoy, but I didn't want it to be so "kiddy" that it would turn adults off. I wanted something that would let me play with atmosphere. 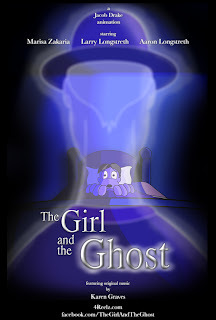 In early 2007, I came up with the idea for The Girl and the Ghost. I liked the idea enough that I went ahead and wrote a script. The script led to the creation of some concept designs. I actually started animation almost immediately, even before giving voicework a single thought. I was trying out ideas and techniques that were new to me and it was exciting! Time consuming, but exciting. Even early on, I was pulling off shots and visuals that I didn't think I'd be able to. Anyone who knows me can attest to the fact that I'm my own harshest critic, so for me to impress myself like that was rare and surprising. I had a feeling this project might actually work out and possibly even be something special. Eventually, the time came when voicework was needed. Larry and Aaron came onboard. Larry was set as William and Aaron would be Harold, a character who actually first appeared in a script I wrote back in 2002 or 2003. I remember Aaron was so excited, he volunteered to do a voice before I even had a chance to ask him. 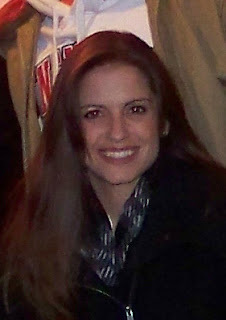 As for the voices of Annabella and her mother, my friend Laura Segura recorded a test all the way out in LA. I loved it. She was in. The cast was set. Time passed, I kept working, and I got a good look at a bunch of the speed bumps that pop up during the movie making process. I was excited to have the cast recording their parts from all over the country (Laura in LA, Aaron in Charlotte, and I recorded Larry here), but I soon saw the problem in that arrangement. Everyone was in different places and using different equipment, this resulted in the audio quality of their recordings not matching up. I tried to fix up the audio, but the difference was still jarring when the characters talked to each other. I'd be able to record Aaron whenever he was back in town, but for my little no budget project, meeting up with Laura or getting her into a studio just wasn't possible. I hated to make the call, but I was going to have to go another way for Annabella and her mother. I had no idea who else I would get to play the parts, but the answer came at our premiere for The Greatest Fan Film of All Time and The Wimp Whose Woman Was a Werewolf in the form of my then new friend, Marisa Zakaria. So, over the course of animating the movie, I'd record Larry, Aaron, and Marisa individually whenever they were free and/or in town. If any lines ended up needing to be redone for whatever reason, it could be a long time before things lined up for us to get together and try again. It was tricky, but we made it work. Our recording studio was my living room. Most of the dialogue was recorded on my MacBook using my Rock Band microphone. Credit goes to Marisa for that one. We were all set to record her lines and the microphone I planned to use wasn't working. Marisa noticed my Rock Band setup and suggested we try that mic. It worked beautifully. For a pop filter, we used a piece of nylon legging stretched over a bent piece of wire hanger. Fancy? No. But it got the job done. Jake Ruby helped out with sound effects and did a fantastic job. Everything sounded just how I wanted it to, but one sound eluded me. 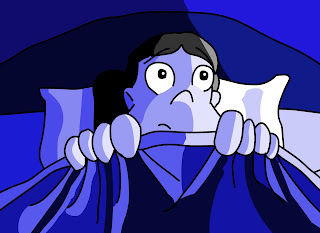 In the movie, just before William appears, Annabella hears bumping and scratching sounds coming from her closet. Jake tried a few things, I searched, but we couldn't find a sound effect that sounded right to me. 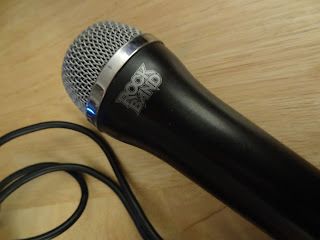 So, I took my trusty Rock Band microphone, put it inside a cardboard box, and had my mom scratch and tap on the outside of the box. Got it. The ability to work with what's available to you is important. A little ingenuity can really save the day when you're in a pinch. Video games to the rescue! Music is a huge part of movies. It helps create moods, it amplifies emotion, it helps the story flow. I wanted great music for this. Not good, great. It was very important to me, but I was nervous because I didn't know who to go to that could do what I wanted. Larry put me in touch with composer Mike Wilkinson. We emailed back and forth a few times before he came up with a sample of music to suit the story and sent it to me. It was outstanding. I was blown away and felt so lucky. As things went on and the project was delayed a few times (which I'll discuss shortly), our schedules no longer lined up. By the time the movie was finally ready to be scored, Mike was committed to other projects and couldn't do Ghost. It was totally understandable, but disappointing to be sure. I didn't think I'd get that lucky again, but I had to keep looking and hoping. 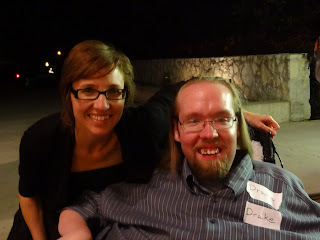 I had met Karen Graves several times over the years, as she frequently plays violin with Chantal Kreviazuk and Raine Maida. I took a shot and asked her if she might be interested in lending her musical talents to the project. It was a long shot, but I had to try. To my extreme surprise, she said yes. I got lucky again. What Karen came up with caught me off guard. I knew she'd create something beautiful, but I never could have dreamed it'd turn out as beautiful as it did. Every time I hear the music she made, I'm taken aback all over again. Karen raised the project to a whole new level. It's a winding road loaded with detours. Changes can pounce out of the blue and target any number of aspects of a project. I had to learn how to assess and handle each change in its own way. I even started making changes on my own. 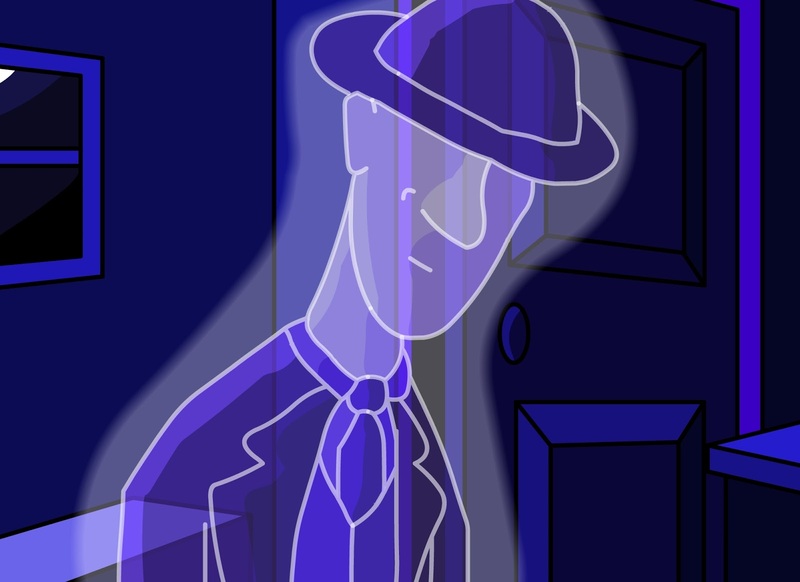 Originally, there was one more character in the story, an evil shapeshifting shadow creature that was pursuing William and appeared in the finale. 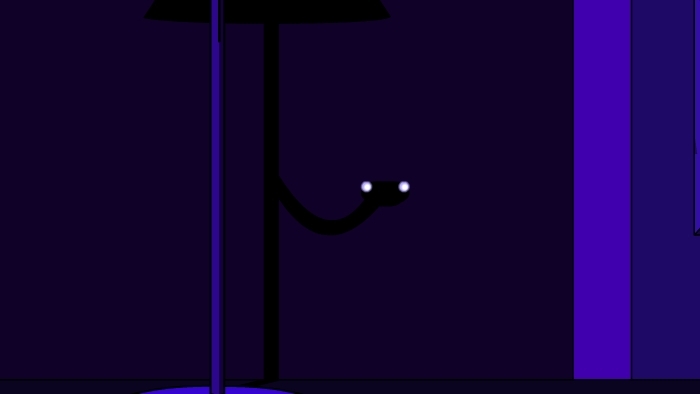 He actually made it into the animation phase, but I realized he slowed things down and wasn't really necessary in the story, so I cut him out. Change can be scary, but sometimes it can be a blessing and improve the end result in unexpected ways, so don't be afraid to embrace it. Maybe he'll get his chance in a future project. 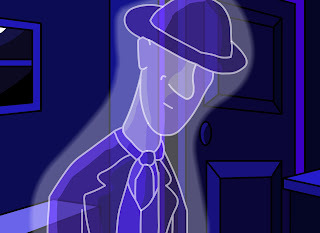 I know how long these projects can take, I know how long animation alone takes, but I can say without exaggeration that I had no idea how long The Girl and the Ghost was going to take. I would get on a roll and make big strides with the animation and then put it on hold when I was needed on another project, or I'd be sick for a while, or life in general would have other plans for me and keep me away from working on it for extended periods of time. 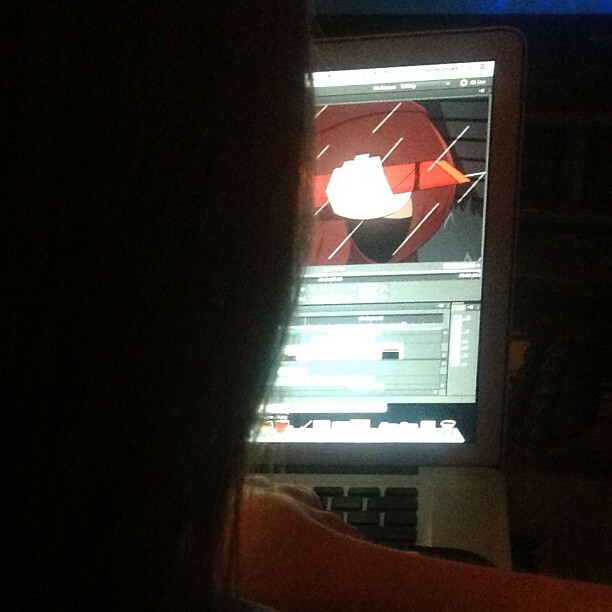 Animation is a slow, tedious process and I'm fully aware that my situation exacerbates that. Most digital artists use a drawing tablet for their work, but my disability doesn't allow me to do that. I have very limited movement in my arms and hands, so I can't draw in the traditional way. Everything I make, I make using only a mouse. 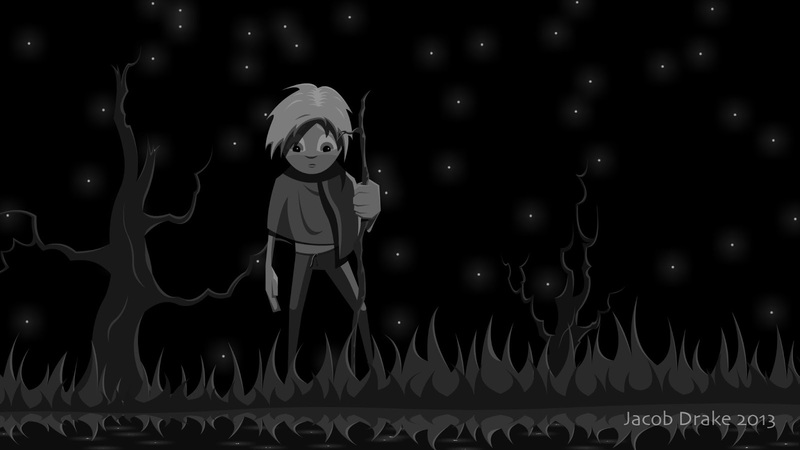 The Girl and the Ghost is 17 minutes long and animated at 24 frames per second. That's a lot of images. Drawing and animating with a mouse is time consuming, frustrating, and can really tire me out, but it was the only option available to me, so it's what I did. Living with a disability, you learn how to adapt to situations that aren't always suited to you. You have to. Using a mouse isn't the ideal animation method, my actual techniques may not be the "right" way to do things, but I do what I need to do in order to make it work. Years have passed and it's finally done. My cousins are older. Since I set out to make this movie, I've become an uncle. 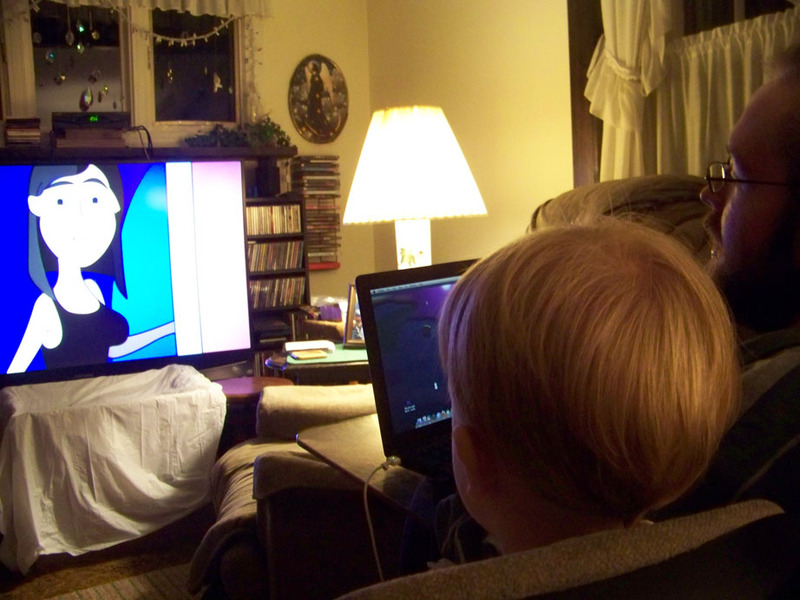 My nephew, Matthew grew up watching me animate it. One of my favorite memories is when I was syncing a character's mouth to the dialogue while Matthew was sitting next to me. He was maybe two years old at the time. Hearing the audio playing one individual frame at a time, he started to mimic the choppy sound of it. "Eh. Ooh. Eeh. Uh." During one of the project's delays, he would watch the first 6 minutes of the movie over and over again, despite its unfinished state. My cousins may have inspired me to make this kind of movie, but Matthew fueled me to see it through. Watch for it and you'll even spot some of his own artwork in the movie. Over 800 hours of animation, plus voice recording, plus sound editing, plus music creation, plus editing, spread out over nearly 6 years. If I've done my job well, you won't think of any of that while watching the movie. You'll only think of Annabella, William, and their story. I hope I've done my job. The Girl and the Ghost went online on November 19th, 2012, almost two months ago. As I write this, it's been viewed 746 times. In the scope of the internet, that's not great, but for a 17 minute long film by an unknown animator? I'm happy. That's 746 more people than had seen it before November 19th. And far more important than the numbers- the people who have seen it, both child and adult, have responded positively. That's what matters. This is what matters. To those who helped me make it, to those who have watched it, to those who supported me throughout this long haul, to those who have shared it...thank you. From the bottom of my heart, thank you. Now, as the Ghost Hunters would say...on to the next. We're already 10 days into 2013 and I've yet to post my reflections on 2012. I'd like to keep the semi-tradition going, but I feel like a full recap isn't really necessary, since the year's blog entries are all right here, so I'll be keeping this one brief. Honestly, 2012 was a long, frustrating, and exhausting year on a personal level. It was rough and I'm glad to put it behind me. Amidst the negative, there was positive. I visited California. I saw my friends. I went to Niagara Falls. Grandma's doing better. On October 13th, little lady London was born, making me the uncle of three beautiful, smart, and strong little people. I'm thankful for those good notes of the year. Creatively, things shifted a bit over the course of the year. I helped Teal with My Gimpy Life, I created the music video for My Dear with Sébastien Lefebvre, and I finally released The Girl and the Ghost. Looking back, I'm so happy with how everything turned out. I'm proud of the results. It feels good. 2013 is shaping up to be a good one too. I'm helping out on a secret little project with my new friend, the amazing America Young and I'm hoping to make something happen with Waiting for the Sun. So, thanks for the good stuff, 2012. Here's hoping 2013 brings more good to us all. Let's rock it.